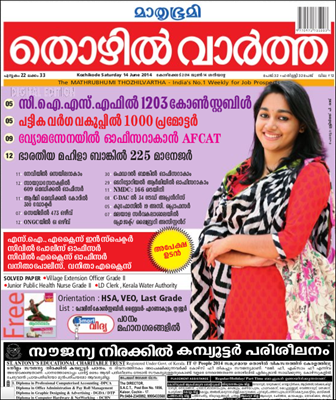 Mathrurbhumi Thozhilvartha, one of the leading employment news and career Magazine in Kerala has published the 14th June 2014 issue. The major highlight of the current issue would be the latest notifications by Kerala PSC which include Sub Inspector of Police – General Executive Branch, S.I. Excise Inspector and others. While going through the pages different career vacancies are mentioned. The vacancies include 609 medical officers in Air Force, 300 doctors (Army Medical Core), 166 Trainee(NMDC), 34 trade apprentice(C-DAC), ONGC(61), 1203 Constables (CISF), 1000 promoters (Ministry of Tribal Affairs) and 25 Manager vacancies in Bharathiya Mahila Bank. Solved papers of Village Extension Officer, LD Clerk, Junior Public Health Nurse Grade II and Kerala Water Authority will enable the job aspires to prepare for the upcoming exams. Notification regarding the Civil Police Officer, Civil Excise Officer, Vanitha Police, Vanitha Excise Guard are also included in this issue. List of Police constable, Driver-Ernakulam and Thrissur are featured. Job seekers can best use the current issue to check for rising opportunities and also could apply for their desired posts. Thozhilvartha, published by the Mathrubhumi group is a blessing for those who keep an eye on employment news from Government, public and private sectors. The editorial board and reporters try to cover almost every employment opportunities in Kerala while serving as an alternative for the State's informative cell in service sector. As an excellent source of information to job seekers in Kerala, Mathrubhumi Thozhilvartha well liked by youngsters is having a huge circulation. Other than the print edition, this employment weekly can be read through its digital version. Other than being the voice of Kerala Public Service Commission (KPSC), it also reports about arising vacancies in Nationalized banks, Union Public Service Commission (UPSC), Public Sector Undertakings (PSU), Private Companies. Much interestingly, apart from other jobs, Kerala city wise jobs and local jobs are advertised in Thozhilvartha. This weekly employment news paper covers details of job opportunities from domestic as well as overseas employers.